Benetton Essence Man is a reliable guide to the world of your passions and desires. Benetton Essence Man 100ml. Eau De Toilette is a fresh fougere. An icy inspiration combining a cocktail of masculine ingredients for cool sensations. The fragrance starts with an iced tea infused with frozen lavender and spicy cardamom to create a fresh masculine burst. Then a surprising combination of bloody mandarin and pineapple gives a touch of fresh greediness, while nutmeg and geranium state the masculine part of the fragrance. The dry down note introduces the warmth of musky woods, then amber leaves a distinct sensual signature. The fragrance has been developed by talented Givaudan's perfumers. Christophe Raynaud signed the Masculine fragrance. Benetton changes the perception of what life is made up of black and white stripes - it's time for the bright happy colors, with no place for boring semitones. 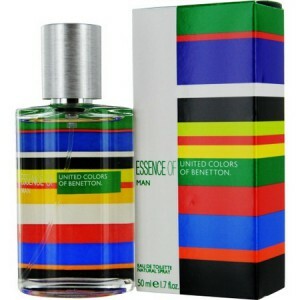 For the most cheerful and motivated Benetton offers a "recipe for the elixir of life" - the scent of Essence of United Colors of Benetton Man. You are young, stubborn and like to be in the thick of things. And this rapid race - the perfect rhythm of your life. Benetton Essence - a reliable guide to the world of your passions and desires, hopes come true and incredible ideas. Sip a cool refreshing tea and a touch of frost flowers just need to cool down before the new tests. Bitter shades of moss and geranium sharpen the senses and give confidence. Benetton Essence - one step to his dream! Top notes of iced tea, lavender, cardamom. Notes the "heart": mandarin juice, pineapple, nutmeg, geranium. Base notes of moss, amber.